Warner Bros. has released the first gamepaly trailer of LEGO Star Wars: The Force Awakens which showcases what awaits you on June 28th. 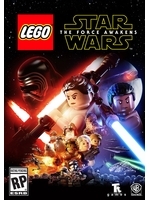 The title features Blaster Battle with cover system, Multi-uilds option and Flight gameplay. The lighting looks a step up. Funny that I don't suffer from Lego game fatigue, I wonder if that's because I haven't played any.